Convert your favourite regular mouth jar into a drinking jar with the addition of these drink lids and large drinking straws. 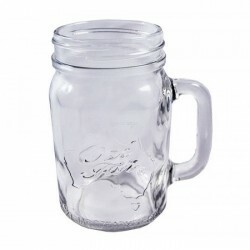 The lid features a large hole which will fit the straw supplied: extra wide for drinking even thicker milkshakes, smoothies or vegetable juices. Lid is white and the straws are green and white. You need a regular mouth lid band to hold the lid on your jar. Pack contains 4 lids and 4 straws. Bands are not included so if you are not using a jar with a 2 piece lid you need to purchase bands separately. 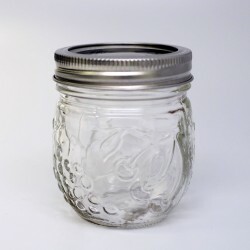 Silver daisy lids may be purchased as optional extrasThese mugs are used as moonshine glasses an.. 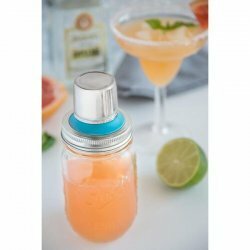 Handle Jar x 1 - 415ml / Beer / Moonshine Glass Drinking Jar Regular MouthThese mugs are used as ..
Lid Silicone Straw Drinking Ecojarz Suits Ball Mason Jars BPA & Chemical Free Regular MouthEco..
Impress your friends with this cocktail shaker lid which fits any mason regular mouth jar!Turn u..